Melrose–Record setting cold temperatures were recorded in Melrose Wednesday, at -38.6, and Thursday, at -41.6, according to known city records. The -38 air temperature Wednesday morning also made Melrose the coldest city in central Minnesota, according to the National Weather Service. The coldest wind chill in the area that same day was in Sauk Centre and Belgrade, where -60 was observed. The unusually cold temperatures were due to a polar vortex, which is a large area of low pressure and cold air surrounding both of the Earth’s Poles, that strengthens during the winter, according to the weather service. Vortex refers to the counter-clockwise flow of air that helps keep the colder air near the Poles. Many times during winter in the northern hemisphere, the polar vortex will expand, sending colder air south with the jet stream. Because of the wicked winter weather area schools were closed Jan. 29, 30 and 31. Businesses closed early on Tuesday, Jan. 29, and remained closed the following day. Evening meetings were rescheduled. There was no city bus service in Melrose on Wednesday. 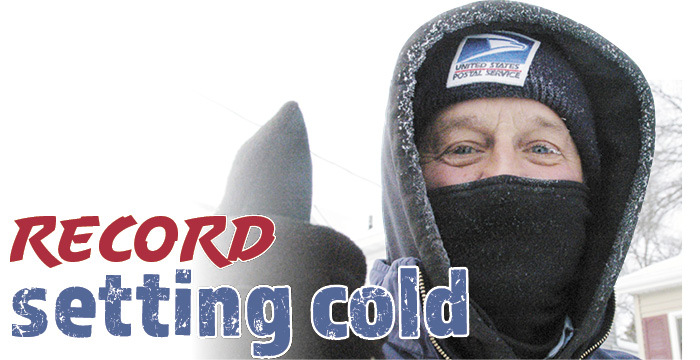 Mail service was halted on Wednesday and resumed on Thursday. But there were some brave souls who ventured out, mainly to grocery and convenience stores, and automobile shops were busy, as vehicles needed to start and other vehicle-related issues needed to be dealt with. The Melrose ambulance responded to two calls on Jan. 29, coordinator Jenn Tschida said Wednesday morning. As of noon on Wednesday, the Melrose Fire Department hadn’t been called out during the cold snap, according to chief Tom Budde. The Freeport Fire Department responded to one call at 12:07 p.m. on Wednesday, putting out a vehicle fire at the New Munich exit. The department’s new truck worked great for the extreme cold weather and nothing froze up, fire chief John Gilk said Wednesday afternoon, after speaking with assistant chief Andy Grieve, who was at the scene. Firefighters were on scene for around 45 minutes. “For the extreme cold 17 firefighters showed up today which is great,” said Gilk. Shaggy’s Towing in Melrose was busier than heck on Wednesday, responding to more than 100 calls for help. “We had three great dispatchers running the phones and five amazing drivers,” Sophie Sabinash wrote on her Facebook page. They appreciate the patience and understanding from people. “It’s been crazy,” Sophie wrote, adding they expected a similar day Thursday. Temperatures rebounded by the weekend. Another cold spell is predicted this week, thankfully not as cold at last week.